Due to its tricky-to-make-at-home nature, Eggs Benedict is often treated as the darling of the brunch menu. 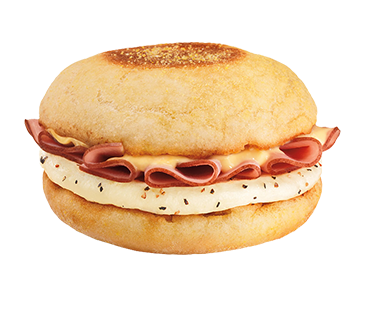 But Dunkin’ Donuts has circumvented that whole thing by debuting its new Eggs Benedict breakfast sandwich, using a cream cheese-ish sort of spread to replace the the traditional Hollandaise sauce, and an egg patty instead of poached eggs. Because messy. Because we’re not sure anyone would savor the idea of a donut chain attempting the time intensive, delicate mix of egg yolk and liquid butter involved in a Hollandaise sauce, Dunkin’ Donuts says the spread it’ll use atop the peppered egg and Black Forest ham sandwiches is closer to cream cheese. “Our employees are used to putting cream cheese on bagels very quickly, so this is no different,” he said. He also aimed to make the sandwich portable, which a poached egg and drippy sauce is decidedly not. “I wanted to take this popular breakfast entree that people order in sit-down restaurants and turn it into something people could get quickly and take with them,” he explained. Because Hollandaise is one of my personal Kryptonites (the others being beets and Bill Pullman), I won’t be trying this sandwich anytime in the near future (unless someone makes an Eggs Benedict Cumberbatch sandwich and then I might be convinced). But feel free to chime in at tips@consumerist.com if you’ve tried the sandwich, and let us know if it’s anything near actual Eggs Benedict.